Integrates touch and proximity functions. VISHAY Intertechnology, represented in Australia by Braemac , has released the TCND3000 surface-mount optical sensor. It integrates touch and proximity functions and operates in conjunction with an integrated circuit (E909.01) built on ELMOS Semiconductors’ high ambient light independent optical system (HALIOS) technology to provide reliable operation in bright sunlight up to 200kLux. The device offers designers a low-cost alternative to mechanical switches. It enables improvements in electronic systems such as mobile phones, automotive systems, home appliances and cameras. It combines an IR emitter as the source for the touch/proximity signal, another for compensation for ambient light, and a photo diode as the receiver for the touch/proximity signal. Working with the electrical signal evaluation system provided by the ELMOS E909.01 IC, the TCND3000 allows contact-free detection of movement through a translucent surface, enabling proximity detection at a distance of 2cm and touch detection at a distance at a distance of 1cm from the sensor surface. As a result the sensor may be contained within a clear protective or decorative casing without loss of sensitivity. The self-adjusting system compensates for environmental disturbances such as ambient light, ageing of optical components, and surface impurities or scratches. 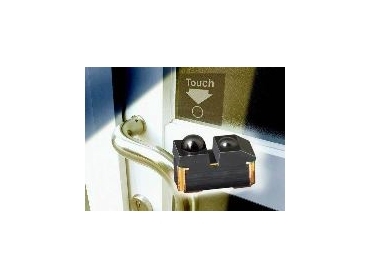 The performance of touch/proximity systems is highly dependent on the precise positioning of the optical components to achieve reliable performance and the design of the TCND3000 meets this requirement.